9x12, xxxv + 109 pp. 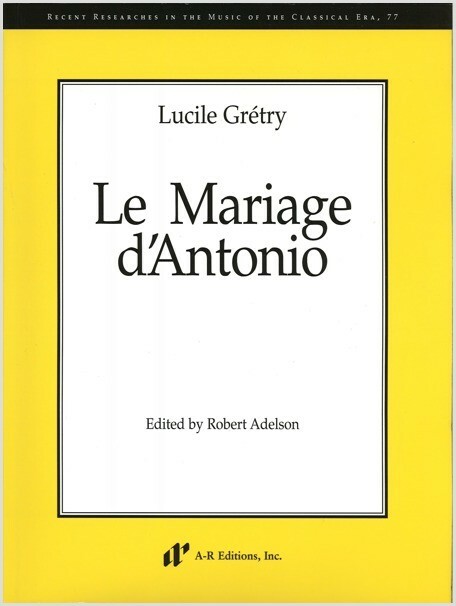 Lucile Grétry’s Le Mariage d'Antonio (1786) was one of the most important works in what became an efflorescence of French opera by women that began around 1770, reached its peak during the revolutionary decade, and finally subsided around 1820. This phenomenon of opera by women was as astonishing at the time as it is in retrospect. No arena in eighteenth-century French culture was more public than opera; it was the locus of cabals, intrigues, and eruptions of invective in print—some of which became major aesthetic querelles. It is therefore all the more surprising to discover that one of the most acclaimed women composers of the 1780s was Lucile Grétry (1772–90), the teenage daughter of one of the most celebrated opera composers in Paris, André-Ernest-Modeste Grétry (1741-1813). Le Mariage d'Antonio was well received in its time, with forty-seven performances at the Comédie-Italienne between 1786 and 1791. [10.] Vaudeville (Colette, Thérèse, Mathurine, Antonio, Antoine, Mathurin, Choeur générale): “Dès les premiers jours du printemps"